Poly RealPresence Group series is the portfolio of Video Conferencing solutions from Poly, designed for huddle rooms, meeting spaces and boardrooms, combining professional video and audio innovations with a simple-to-use interface and unmatched support and services. 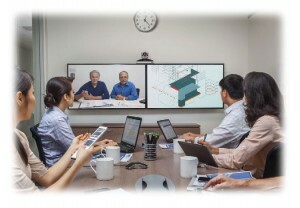 The Poly RealPresence Group series includes the Poly Group 300 (now End Of Life) Group 310, Group 500 and Group 700 video conferencing systems. Poly Audio Innovations – Why Poly for Audio? The Poly RealPresence Group 310, 500 or 700, combines great video experiences and a new breakthrough simple interface with the broadest interoperability and lowest total cost of ownership of any video. Effective group collaboration has never been more important in business communication. Geographically dispersed teams need to get more done with fewer resources making video collaboration a critical tool for improving meeting productivity and breaking down distance barriers. 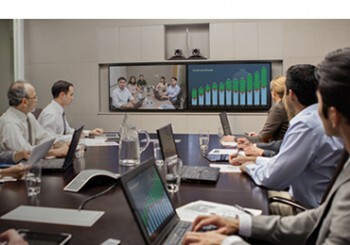 The Poly RealPresence Group Series (310, 500 and 700) brings a new standard of efficiency and productivity to your company’s room-based group collaboration by combining great video experiences with a new breakthrough simple interface that’s easy to use from day one. And with Polycom’s commitment to open standards, your system will interoperate with millions of other devices across the globe without costing you a small fortune. A breakthrough user experience (Poly UX™) that’s easy for first time users – no need for specialised training. Poly SmartPairing™ technology* makes it simple to use your Apple iPad tablet to start and manage video calling. Full 1080p60 high definition (HD) video delivering the industry’s most lifelike HD image quality. Content sharing up to 1080p60, plus full motion High Definition people at the same time, helping to eliminate compromises when sharing across distances. Poly provides a set of industry-leading audio technology that dramatically improves the sense of realism, resulting in more productive meetings. Being fully standards-based, you can call millions of other standards-based video systems in use today. In addition, Poly’s relationship with Microsoft enables solutions for integration or interoperability with all of Microsofts UC Environments, including integration with Teams, Skype for Business and Office 365. Dependent upon the integration required, your users workflow, federation and flexible working policies, VideoCentric can work with you and Poly to provide the most suitable solution for your Microsoft needs. H.264 High Profile technology that now extends to 1080p60 experiences for whole new levels of realism at up to 50 percent less bandwidth. Three models to choose from – Poly RealPresence Group 310, 500 or 700 – providing just the right features and functions for every environment and budget. Support for previous investments in Poly technology, including select cameras, microphones, and UC innovations such as Poly EagleEye Director and Polycom Touch Control. VideoCentric’s partnership with Poly is built on a strong and well established relationship built over many years of sales, integration, solution development & infrastructure support. VideoCentric are fully accredited with Poly at Gold Partner level, and hold certifications including Video Conferencing Solutions, RealPresence Infrastructure and Video Border Proxy (security). 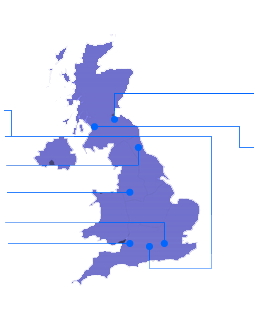 VideoCentric have specialists fully trained in Poly Sales and Technical tracks, Poly RealPresence and Poly Video Networking. VideoCentric have scooped top Poly awards for their extensive support and services offered to customers. VideoCentric also have the Poly RealPresence Infrastructure integrated with Microsoft Teams, Lync 2010, 2013 and Office 365 in our lab & interoperability testing suite, so we can fully understand the integration between each platform, the solution features & downfalls & how to fully support each solution deployed, whether on-premise, in the cloud or as a hybrid.